Scentwork. Solely the domain of bloodhounds hunting escaped convicts on wooded mountain ranges, patient spaniels on drug-hunting duties in airports and canine saviours sniffing out bombs on the front line? Not anymore! Now scentwork can be for any dog and any owner, because if there is something that dogs do well it’s following a scent. Don’t believe your dog can do it? Think of all the times you’ve been wondering what he’s sniffing out walking to find him bolting something down the next minute or how he is able to find a well-used ball in impossible looking brush. I remember finding Rory, my labradoodle, with his head in my handbag – something he had not done in the four years I had been owned by him. I was fuming, until he pulled out a dog chew that a friend had given me. How could he know it was there if not by scent? Rory loves searching for things – just one look at his tail beating the ferns from side to side as he searches for a ball I’ve accidentally thrown in the wrong direction confirms it. It was this thought that drove me to sign up for a Talking Dogs Scentwork workshop, and it was there that I discovered the speed of Rory’s tail wagging is actually an ‘indicator’ that he is on a scent or has found something. Other common indicators include double-checking areas and air sniffing, but each dog has their own personal scentworking style. There is no definitive information on how much better a dog’s sense of smell is than our own, but it’s safe to say that it’s much more sensitive. As Pam Mackinnon, founder of Talking Dogs and an ex-customs dog handler, says: “If you can smell it, they can smell it – times 1,000!” The six dogs in my class proved this beyond any doubt. We used pre-scented stuffed mice as the search object to teach our dogs to ‘find’ and after teaching the dogs what they were looking for – ie a mouse that smells like the chosen scent – we were off with blind searches in and out of cardboard boxes and on, under and behind other objects in the room. Rory was having a ball, this was the best thing since chicken was invented as far as he was concerned. By the third search, he needed almost no direction. Who knew a dog could be so motivated just for the reward of play?! We all had the opportunity to watch the others work their dogs, too, and it was an eye opener. The most interesting part was learning how motivating your dog to take part in a game of ‘find it’ can help their focus, your bond with your dog and even help ‘problem’ behaviours, such as debilitating nervousness or dog-on-dog aggression. 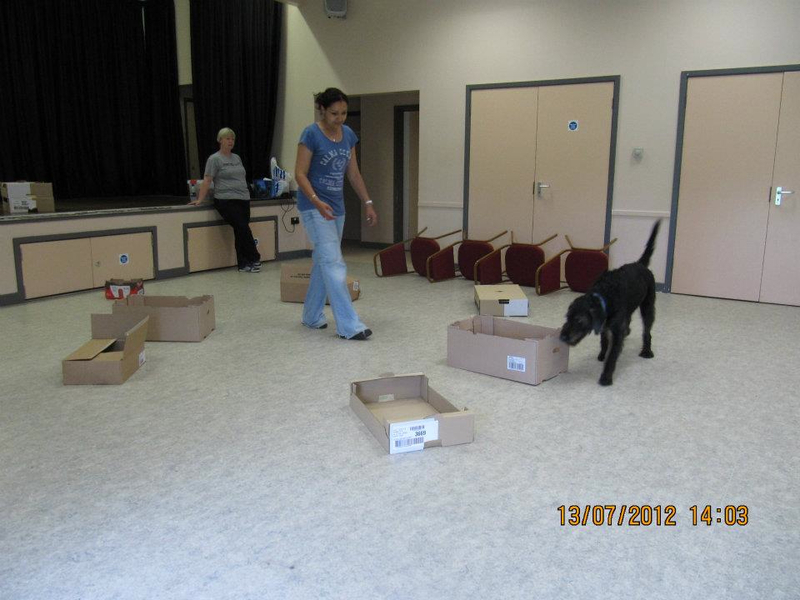 A couple of the dogs in the class were very reactive to other dogs at the beginning of the day – barking and lunging. When they started searching, nothing mattered except finding their mouse. Even though the other dogs were in the room, to the dog mid-search, it was as if they didn’t even exist. I definitely would do it with Rory again – he loved it! I even took home a starter pack so we could carry on searching at home. You can see Rory’s very first search here. Unfortunately I was standing in the wrong place to guide him around – you’ll see what I mean. For more information on courses near you, visit the Talking Dogs Scentwork page here. The workshop I attended was organised by Paws for Success. On the right trail – scentwork for all dogs | Live. Love. Learn. Write.